Pretzel bites with honey mustard dip are a versatile snack for kids of all ages. Enjoy a few any time you need a sweet-and-salty snack! Welcome to the April edition of Progressive Eats. This group of bloggers recreates the idea of a progressive meal (where diners go from house to house to enjoy different courses of a meal) in the blogosphere, where you hop from blog to blog to enjoy different recipes that make up this party. I’m filling in this month for one of the regular contributors. The theme this month is pretzels, and is one of the reasons I jumped to fill in. I love, love, love pretzels, particularly the soft kind, and I’ve never made them at home before. Philly soft pretzels, butter-laden Auntie Anne’s pretzels, soft pretzel bites — YUM! We attended a birthday party for one of my son’s daycare classmates last year, and they had a whole tray of pretzel bites with three accompanying sauces. I was in heaven. I think I only snacked on pretzel bites. And cake, of course. I started researching recipes for pretzel bites. I was somewhat surprised (though at the same time, somewhat not) to find out that pretzels contain yeast. I knew they had the same texture as bread, but they seem to much denser. I also discovered that, like homemade bagels, soft pretzels are boiled before baking. Boiling sets the crust before baking, resulting in the chewy texture. The baking soda in the boiling water adds to the flavor of the pretzel. These were so easy to make, and they were ready to eat in just over an hour. I tried to find pretzel salt, but it wasn’t available locally. I would have had to order it in larger amounts than I needed from the internet. After some reading, I found that coarse sea salt provides mostly the same flavor, so I used that instead. There are so many options for dip: yellow mustard, spicy mustard, cheddar cheese, beer cheese, the list goes on and on. My fiance specifically requested honey mustard, but feel free to use the dip of your preference. I like the slightly sweet tang in this dip, it complements the salty pretzel bites quite nicely. Leftover pretzels can be stored at room temperature for up to 3 days, or can be frozen for up to 3 months. In the bowl of a stand mixer, combine the 1 1/2 cups water and yeast. Stir to combine, then let stand for 5 minutes. Add the melted butter, sugar and salt and stir. Then add 3 cups of the flour, one cup at a time, while mixing on low speed with the paddle attachment. Switch to the dough hook. Add another 3/4 cup of flour and mix on low speed until incorporated. If the dough is still sticky, add more flour, 1/4 cup at a time, until the dough isn't sticky. Increase the speed to medium-high and knead the dough for 3 to 4 minutes, until a ball of dough forms around the hook that clears the sides of the mixing bowl. Transfer the dough to a mixing bowl lightly sprayed with nonstick spray. Cover with plastic wrap and set in a warm area for 10 minutes. Preheat the oven to 425 degrees. Line two baking sheets with parchment paper or silicone baking mats. Place 9 cups of water plus the 1/2 cup of baking soda in a large pot. Do not turn on the burner yet. Divide the dough into 6 roughly equal pieces. Shape each piece of dough into a tight log, then let rest for 10 minutes. With your hands, roll each log into a rope 20 inches long, starting in the center, keeping even pressure, and moving out to the ends. With a sharp knife or bench scraper, cut each rope into 10 pieces. Turn the burner on under the pot of water/baking soda. Bring to a boil. Once it reaches a rolling boil, drop 8 to 10 pieces of dough in at a time, and let them boil for 20 seconds. Remove with a slotted spoon to the prepared baking sheets. Repeat until all pieces of dough are boiled. Beat together the egg and 1 tbsp water. Brush a light layer of the mixture over each piece of dough. Place the pans in the oven and bake for 15 minutes, until deep golden brown. Remove the pans from the oven and set on wire cooling racks. After the bites have cooled for about 5 minutes, brush a thin layer of melted butter over each. Sprinkle on the the pretzel or coarse sea salt. Make the dip: in a small bowl, whisk together the mustard, honey, mayo and lemon juice. Season to taste with salt and pepper. Pour into a serving dish, and serve with the pretzel bites. 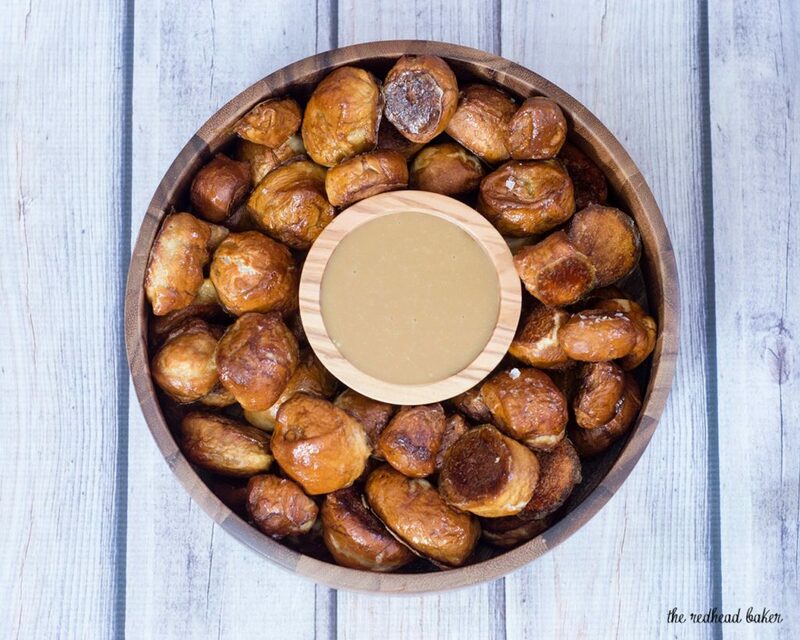 Mmmm…I love pretzel bites…especially with honey mustard dip! These would be completely dangerous in my hands! Pretzel bites and cake sounds like a perfect meal to me! Seriously, though, your little bites are looking so golden and delicious and I must try that honey mustard. 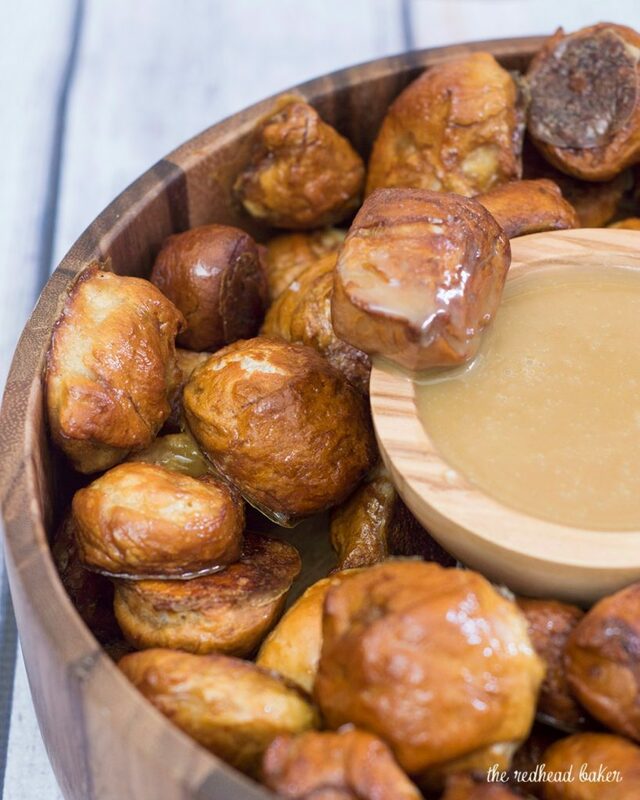 Pretzel bites are one of my favorite snacks! Thanks for sharing your recipe. 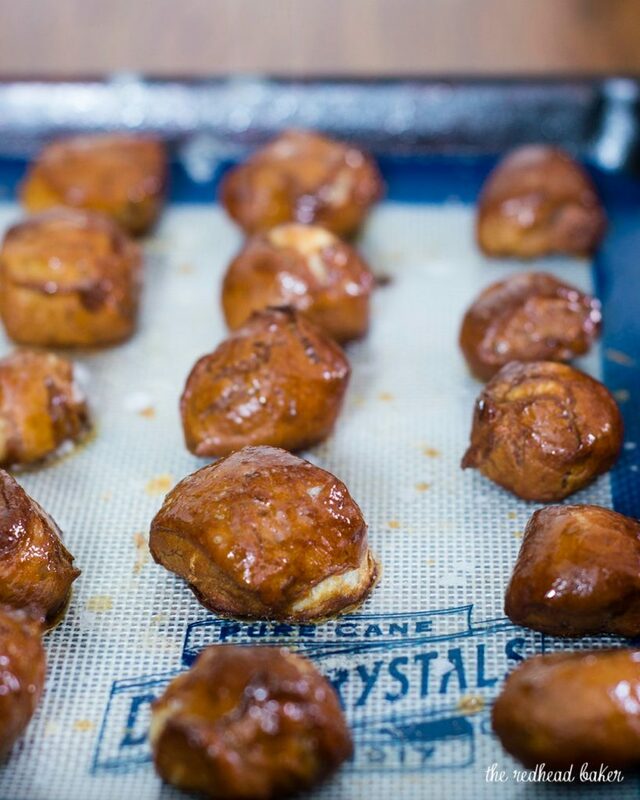 I could eat my weight in these pretzel bites! Gorgeous photos too! 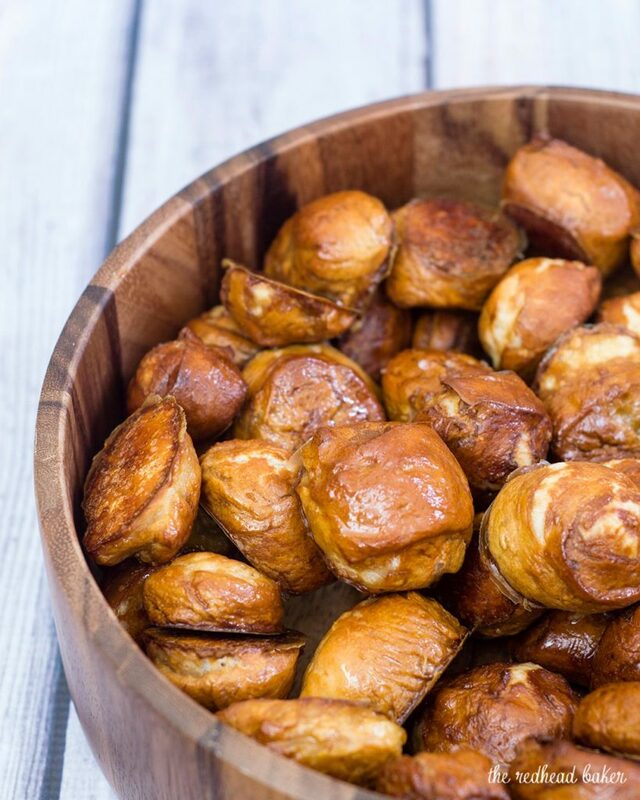 Love these bites, especially because one of the best parts of a pretzel is the salt, crisp outside, and these have a lot of that! 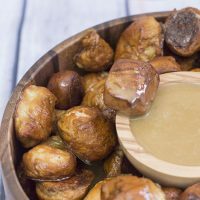 I agree that sweet and salty is perfect together, so hooray for honey mustard dipping sauce!